The yearning to crown one’s head with gold is as old as mankind itself. From the fourteenth century until the French Revolution (1789–1799), dress codes maintained a strict regime over the wearing of certain clothes within the different estates or classes of society, and this included "Goldhauben" – golden bonnets – as well. Because of its monetary value and lustre, gold was deemed to be the quintessence of splendour and thus a yardstick in class distinctions in clothing. The "Goldhaube" in helmet form – known as the "Linzer Goldhaube" – is one of the most attractive headdresses in local traditional dress – "Tracht" – for women. Ignaz de Luca mentioned this form of traditional bonnet for the first time in 1782 in his travelogues. The classical form established in 1835 and to a certain degree concluding the development of the bonnet can be traced in documents as "Goldhaube" right back to the thirteenth century. 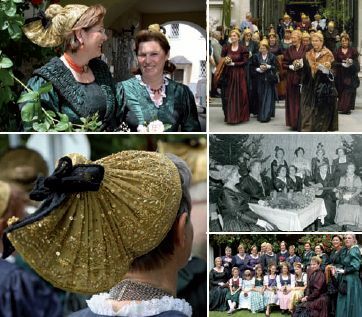 Today in Flachgau and Tennengau and in the city of Salzburg there are twenty Goldhaube groups – and a further eight traditional-dress groups for women that include some who wear the "Goldhaube". All in all, they number around 1,200 members. The exhibition presents an opportunity to see how they interweave in a fascinating dialogue with the works of six artists. Installations are arranged in four rooms in which Miriam Bajtala (Vienna), Erich Gruber (Salzburg), Hauenschild Ritter (Linz), Wilhelm Scheruebl (Radstadt) and Ulrike Stubenböck (Telfs) respond individually to established traditions and arrive at intriguing approaches to the theme that provide visitors with plenty of food for thought.